So Payscale has a new compensation best practices report out. It’s a pretty comprehensive summary of what companies are doing in the market from a comp best practice standpoint, touching on more or less every pay related topic under the sun (the survey even breaks its data out by company size). 1. You really should – it’s just wonderful.You can read the whole thing here,1 but today I want to talk about one particular component of the survey. 1. Individual incentive bonuses are pretty much standard once one reaches a certain level professionally, but did anyone expect that 2/3rds of even small companies give them out? 2. Conversely, I’m shocked that the hiring/sign on bonus number is so small even among large companies. More or less everyone I know received a hiring bonus out of school (and they signed with a fairly significant medley of fortune 500 companies). This of course just goes to show that anecdotal evidence is just that. It’s always good to have comprehensive data sets. 3. I’m pleasantly surprised to see that a quarter or more of employers at all size levels are giving team incentive bonuses. The workplace is becoming a more and more collaborative place over time, and organizational success is driven by talented groups far more often than rock-star individual contributors. Don’t get me wrong – individual incentive 2. Although far too often individual incentive comp ceases being an incentive and becomes an entitlement – particularly when it’s not strongly aligned with challenging performance targets. This is a great post for another day. bonuses are of course great as well 2 – but if there is some extra money in the coffers team incentive bonuses are a fantastic tool to build employee engagement and increase performance. 4. I think retention bonuses are generally ineffective, and am also not surprised to see the largest companies pay them out twice as much as anyone else. 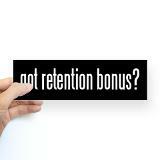 Essentially, there are three types of retention bonuses. A. The “We know you’re unhappy here, but please don’t leave us! We have lousy succession planning and no one else can do your job so we’d rather have you here and miserable than have to figure out how to run this place without you!” bonus. This is a terrible bonus to give out, and if your company does then it’s doing it wrong. B. The “We know you’re eventually leaving (or getting laid off), but we’re in the middle of this merger/acquisition/closing and we need you here while we get through this thing.” bonus. This is a perfectly acceptable bonus to give. Someone has to be there for the end, and those someones will probably have to delay their job searches a bit to be there for said end (because most employers don’t generally want to extend offers of employment with start dates several months into the future unless it’s for a college hire or an executive in a key role with a phased out retirement). C. Finally, there is the “We’ve been underpaying you for a long time, you’ve figured it out and are unhappy, and we don’t want to lose you so we’re making it right.” bonus. My thoughts on this one? If the employee had to complain about his or her pay before 3. Executives are an exception. Complaining about pay in the case of executives is just part of the ongoing salary negotiation process that begins soon after the offer is accepted and ends at retirement.anything was done about it then it’s probably too late. 3 But good on the employer for finally making things right, I guess? 5. 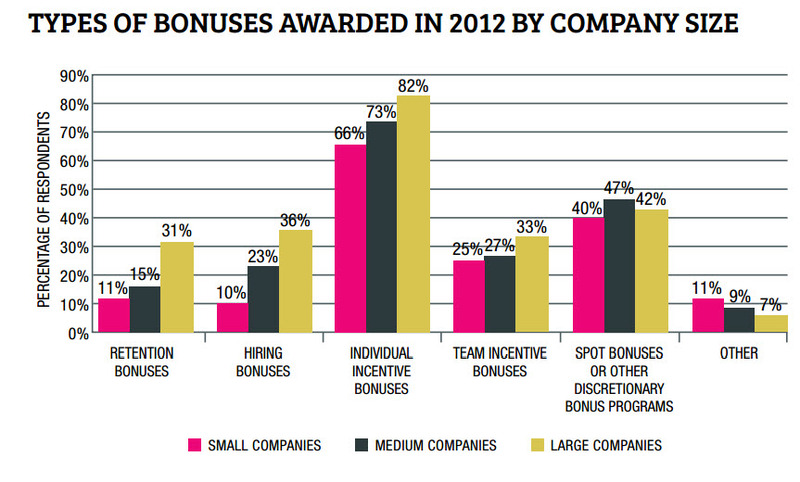 Spot bonuses are wonderful, and I’m thrilled that 40+ percent of companies are giving them. One of my professional mentors once pointed out to me that frequent, small raises are better than annual large ones for 4. A big pay raise feels great for a few weeks or months and then the employee is over it as the wage becomes the new normal. On the other hand, small little raises over the course of the year leave an employee in a perpetual state of extrinsic reward cloud nine.employee morale 4, and in my opinion the spot bonus is the ultimate application of this philosophy. A slap on the back and verbal accolades are always wonderful to receive, but nothing says thanks for a job well done quite like an unexpected cash bonus for a job well done (and besides, if a company starts giving money away all year there is no rule that says the merit budget has to stay as large as it was before). A friend of mine (also in compensation) recently recounted the story to me of a spot bonus program at her company called “Thank You Bucks”. 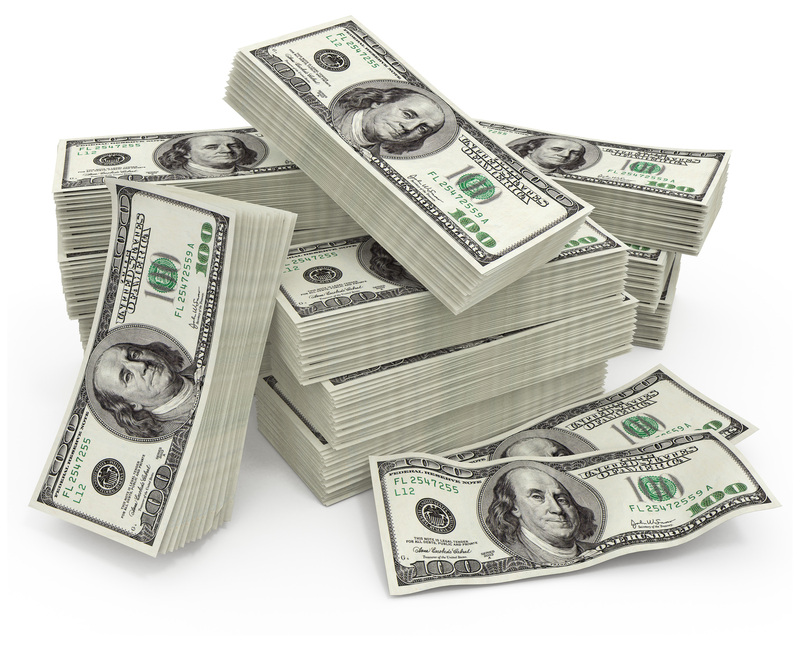 Basically, every manager has a certain amount of cash in their quarterly budget earmarked to give to employees who demonstrate exceptional performance. If an employee completes a project quickly (and with strong results), exceeds expectations on a difficult project, improves the work environment in “X/Y/Z” way etc. then they can earn “Thank You Bucks” at any time during the quarter – money that shows up in the next paycheck. Setting aside the risk of nepotism and/or corruption here, this is a fantastic idea. If I’m ever CHRO/SVP of HR I am 1,000% implementing something like “Thank You Bucks”. …Anyway, that’s it for now. I kind of want to talk about the “other” 5. What does this even encompass? I wish I could look at the raw survey data here and see what employers put in – assuming there was a comment box this had to have been absolute comedy gold.bonus section listed on the chart, 5 but it’s getting late. Hi Rory, another great post, tks for sharing! I agree with your statements but got surprised by one info: I thought small companies would outperform large/medium companies paying individual bonuses, once they can maintain their free cash flow (by keeping fixed costs low) as well as attracting top performers with higher upside payouts. As for the hiring bonuses, at least in South America, is something that is getting rarer and rarer (as a matter of fact, I think 36% is higher than I would guess – of course I know several people that receive, but this could be biased sample, don’t you think?